Assiri added that Riyadh is “ready” and will fight with the United States-led coalition to defeat the Islamic State group in Syria. When asked about the timing of sending the troops, he said that Washington is more suitable to answer that question. The Saudi comments Thursday come just one week after Riyadh said it was “ready” to send thousands of troops to Syria if the U.S.-led coalition decides on a ground operation in the country. Thursday’s comments confirm the existence of the plan and the Saudis are expected to dispatch troops to Syria at some time in the future. Responding to the Saudi comments, Russian Prime Minister Dmitry Medvedev told the German Handelsblatt business daily that Saudi Arabia and its Western allies must sit at the negotiating table "instead of unleashing a new World War." Observers of the Syrian conflict say a ground intervention will be framed as a humanitarian intervention to help civilians and would involve Turkey and Saudi Arabia along with U.S. troops in Syria. “Armed intervention by the Sunni states could be presented as the creation of ‘a safe zone’ for the tens of thousands of displaced people in the area, though it certainly would not be safe as it would be in the center of a battle zone,” Patrick Cockburn, award-winning Middle East journalist and correspondent, wrote for The Independent Thursday. 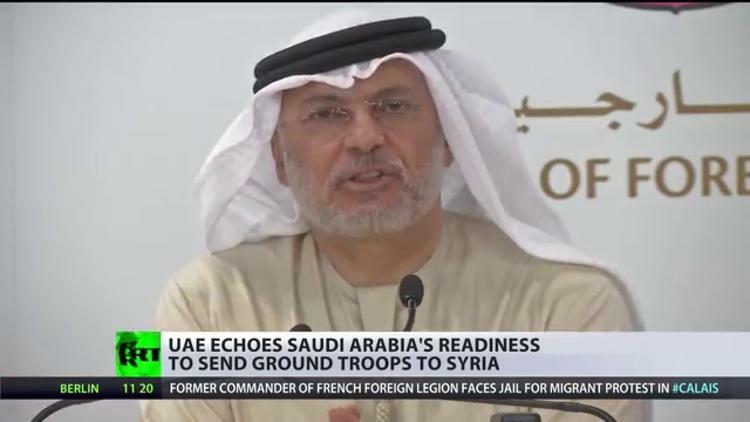 “If Saudi Arabia does intervene in this part of Syria it will become yet one more combatant in the most complex and dangerous battlefield in the world,” he concluded. A new report by the Syrian Center for Policy Research released Thursday says 11.5 percent of Syria’s 22.5 million population has been killed or injured since the beginning of the conflict in 2011. Almost 500,000 people have been killed, doubling previous estimates.